I re-potted some topiaries into blue and white containers. for the French buffet in the foyer. 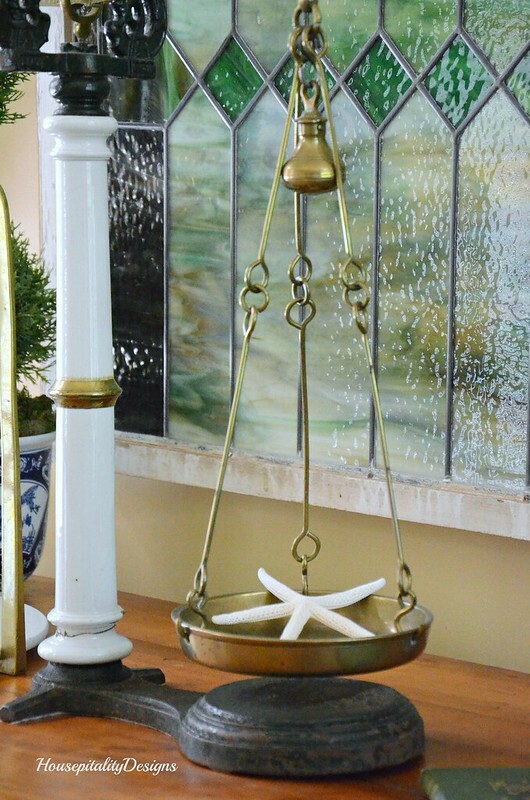 A simply stated starfish is placed in the vintage scale. The blue and white plates and lidded egg cups remain on the sconces. and less clutter as I start to stage my home to place it on the market. amount of furniture in each room. I shall start in the sunroom tomorrow and present my before and afters to you. Shirley, blue and white always works. If Kim doesn’t have room for the scale, I do! Oh Shirley…we just sold our big house to downsize and have been in the new (big) house a few weeks. WHAT A JOB! Still unpacking and arranging and cleaning. My heart goes out to you. We didn’t downsize after all except for the boats but we did relocate to a dry lot in a different city. Love the arrangement, so neat and summery. Love the blue and white scheme. You have a big job ahead of you but I know you are up to it! Hey, you posted a shop you discovered on facebook the other day. Was it in Johnson City? Thanks! It’s beautiful Shirley. I don’t think you can go wrong with blue and white. 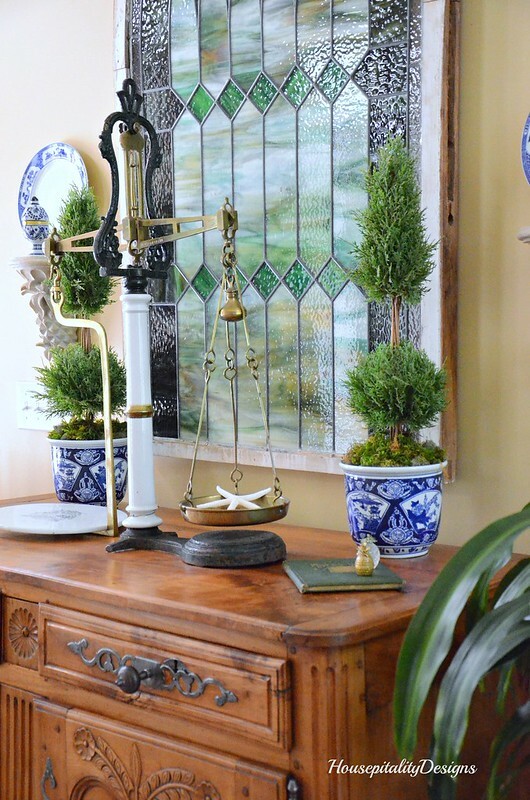 Always a classic and works with so many different decor styles. The blue and white is simple classic! Looks great! I went thru the downsizing and it was tough….I did not want to sell anything. But now I’m glad I did.Looking forward to see your staged home. Tennessee?….we are in Illinois and it is so hot!!! 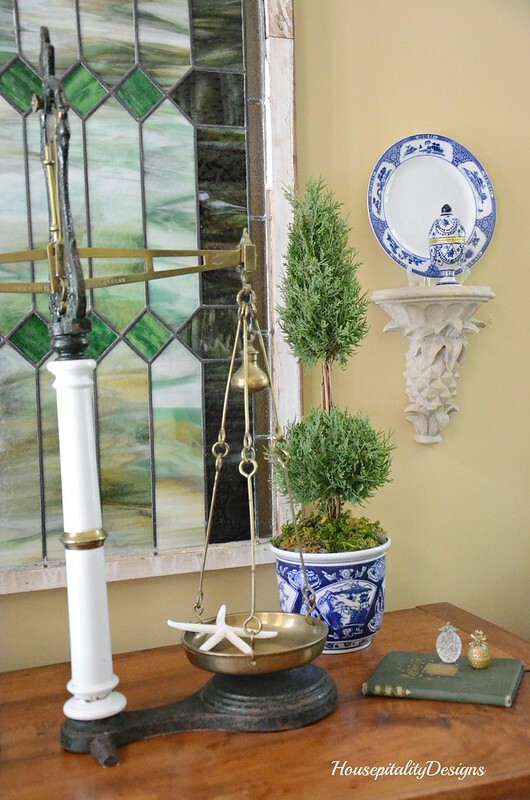 I LOVE this vignette, it is so bright and fresh looking. Looking forward to the “staging” looks!!! Have a great day my friend!!! Very pretty – you can never go wrong with blue and white! Shirley, I love the starfish in the scale! So simple but striking. Good luck with getting the house ready to sell! Your entry looks beautiful, Shirley! Blue and white is my absolute favorite. Try not to work to hard getting the house ready to sell. I know it can be a chore! Lots of work ahead. I bet you’ll be surprised at how fast your home will sell! Love the blue and white planters! 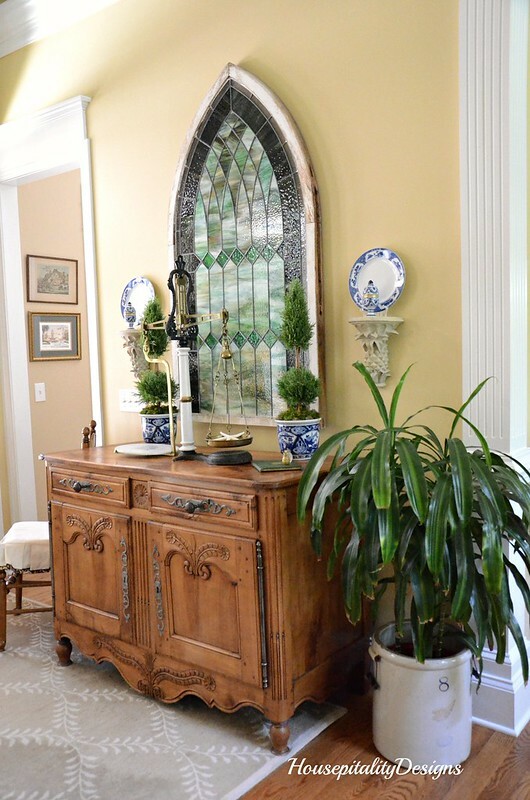 I’ve always loved your stained glass window over that handsome buffet! We went through the same thing two years ago. All I can say is use your OWN best judgment and to reduce clutter but don’t go crazy just to satisfy your realtor. Your beautiful home will sell quickly! Mary’s recent post…Red, White and Blueberry Biscuit Shortcake! People will be taking notes about your decorating style when they are looking. In fact, they might want to buy the house furnished! Oh my, downsizing is such a job. Good luck packing, that is always so hard.